I picked up an advance review copy of this book at ALA Midwinter. 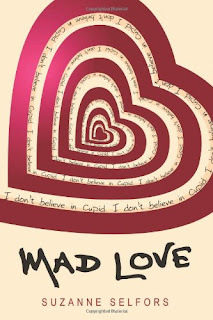 Mad Love is now available in hardcover. Reader Gut Reaction: I have to admit—I wasn't entirely sure I'd like a retelling of the story of Cupid and Psyche. Fortunately, this wasn't a straight retelling; the author took a "REAL story of Cupid" approach, setting the tale in modern-day Seattle. Not only that, she made the book not so much about Mr. Eros—currently known as Errol—as it was about the narrator, Alice, and her coming into her own. Helping Errol commit the true story of his life to paper provides the vehicle for Alice to sort through her own confusing life, and helps Errol/Cupid become immortal in a different way. Though a few aspects of the story seemed rushed in terms of their resolution toward the end, this was great light reading, and perfect for Valentine's Day. Concerning Character: This book's cast of characters is surprisingly multilayered—at first glance, they may seem like a collection of humorous types (and, in some cases, archetypes), but everyone is realistically flawed, unique and human. Yep, even Cupid. Alice—cursed with the last name Amorous, thanks to her romance-writer mother—is an engaging narrator, just a regular girl in many ways, struggling to cope with a rather unusual life. Her mother is in a care facility being treated for bipolar disorder, which they're trying to keep a secret from her mother's publisher and the media. Alice really wants what a lot of other girls want: a stable life, free from the extra responsibilities that her mother's situation has forced her to take on; friends; maybe even a boyfriend. Her potential love interest, Tony Lee, is appealingly geek-cute and the kind of nice guy who makes you go "aww..." Cupid is enigmatic and, well, mercurial, to say the least. And Alice's 4-unit apartment building is populated with an interesting cast of side characters and surrogate family members who all contribute to the plot in their own small, fun ways. Recommended for Fans Of...: Myth and fairy tale retellings like Ice by Sarah Beth Durst, Troy by Adele Geras, and the Ellen Datlow-Terri Windling-edited series of anthologized fairy-tale retellings. Themes & Things: Obviously, LOVE is a major theme here—but we get to introduced to the different kinds of love as the Greeks saw them (Eros vs. friendship vs. agape and all that stuff), in a way that fits well into a modern setting. Alice comes to realize that loving her mother isn't necessarily about protecting her from everything like a delicate hothouse flower, but about connecting and communicating. She learns the difference between Cupid's lightning bolt of desire and her feelings for Tony Lee. I think the most important thing Alice figures out, though, is that love involves trust, and reaching out, and even a little risk. Authorial Asides: There were a lot of sly nods here to writers, and writerly in-jokes that seemed to jump out at me—these might or might not be intrusive to some, but for the most part, I think teen readers (especially aspiring writers) will enjoy them, as well as the glimpse into the inside world of writing and publishing. You can find Mad Love at an independent bookstore near you! Love the cover and the title, wasn't sure I loved the flap copy. Will have to take a more serious look at it based on your review. Thanks, Sarah! Yeah, the flap copy sort of put me on the fence about reading it, but it ended up being very charming. Suzanne Selfours always does whimsical well - and while the original story of Cupid and Psyche has never been a favorite, this sounds good. Has it really been since 2005?! It's Kind of a Funny Story... Until It's Not.